On November 13th, the U.S. House of Representatives Committee on Energy and Commerce Subcommittee on Environment and the Economy is holding a hearing to debate the Chemical Safety Improvement Act (CSIA). Here at BCAction, we are committed to ensuring on the the strongest, most meaningful chemical safety regulations move forward – you can read more about our position on CSIA here. Earlier today we sent the following letter to the Representatives who make up the Subcommittee on Environment and the Economy so that our voice is heard in time for tomorrow’s hearing. I am writing to express serious concerns about the Chemical Safety Improvement Act, in advance of tomorrow’s hearing, S. 1009 Chemical Safety Improvement Act. Breast Cancer Action is a national, feminist grassroots education and advocacy organization that works to address and end the breast cancer epidemic. Breast Cancer Action is committed to reducing involuntary exposures to toxins that are linked to increased risk for breast cancer. Breast Cancer Action recognizes that the current congressional interest in the Toxic Substances Control Act (TSCA) represents an important opportunity to pass landmark cancer prevention legislation. After years of work, along with our partners, for strong regulation of toxic chemicals we are heartened to see widespread agreement that TSCA is a top priority for the current Congress. However, we recognize that some proposed changes to current law do not adequately protect public health. We believe that the Chemical Safety Improvement Act (CSIA) as it is currently written falls short of the reforms that are needed to stop breast cancer before it starts. This bill in its current form not only lacks key requirements to protect people and our planet from toxic chemicals, but if implemented, could actually weaken the few strong toxic chemical regulations that currently exist. Burden of Proof: the CSIA places the burden of proof for chemical safety on government regulators by tasking the Environmental Protection Agency (EPA) with proving that a chemical is toxic, instead of tasking industry with proving a chemical is safe. This maintains a system that does NOT work for our health. A strong chemical regulation bill will require that chemical manufactures bear the responsibility to sufficiently prove chemical safety. Precautionary Principle: the CSIA ensures that the status quo of assuming chemicals are innocent until proven guilty is maintained. A strong chemical safety bill should require that products are proven safe before they enter the marketplace – not after they are already in our homes and our bodies. Protection for Heavily Impacted Communities: the CSIA does not specifically address the needs of communities heavily impacted by chemical exposures. We need provisions to reduce toxic chemicals in “hot spot” communities and this should be central to any proposed chemical regulation. Preemption of Current Laws: the CSIA would give the EPA authority to preempt state or municipal efforts to regulate toxic chemicals — essentially weakening strong state and local regulations of toxins, significantly reducing protections for people living in cities or states that have prioritized minimizing chemical exposures. This provision means that the CSIA could actually leave many people with weaker chemical regulations than currently exist. This preemption must be removed from the bill. Just last month, over 32,000 people from across the United States signed Breast Cancer Action’s Toxic Time Is Up petition to demand strong, comprehensive TSCA reform based on the principles outlined above. 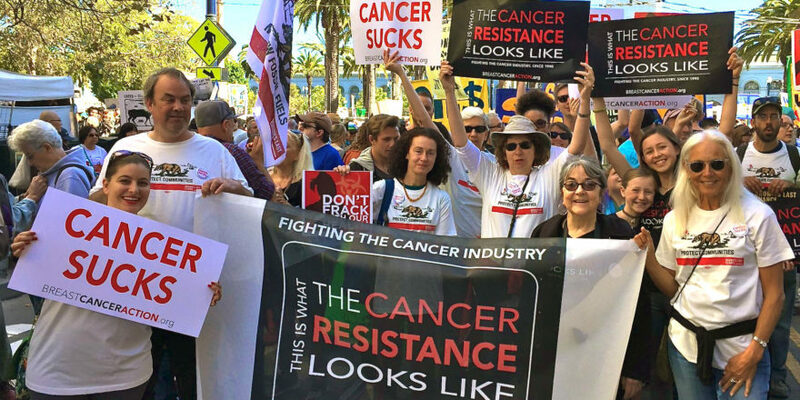 Public interest in chemical safety is growing and more and more people are calling on elected officials to enact strong chemical safety regulation that will reduce a range of devastating diseases and disorders, including breast cancer. As you consider the future of TSCA, I call on you to put public health before chemical industry profits and commit to passing the strongest TSCA reform bill that will protect all of us from hazardous chemicals in our daily lives. We remain optimistic that by enacting strong, common sense TSCA reform, this Congress can deliver landmark cancer prevention legislation that will serve the public and protect our health.